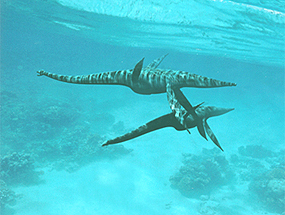 Plesiosaurs were magnificent ocean-dwelling reptiles that "flew" gracefully through the water with massive paddles. They are often mistakenly called 'dinosaurs' but they not dinosaurs and are correctly classified as marine reptiles. They were around almost as long as the dinosaurs from the Triassic period 220 million years ago until the end of the Cretaceous 65 million years ago. Their remains have been found on every continent. First discovered in the Jurassic formation of Lyme Regis in England in 1820, the name meaning "near-reptile" was meant to differentiate the understanding that these creatures were more reptilian than the fish-like Ichthyosaurs discovered in the same region. 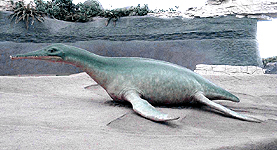 Plesiosaurs first emerged in the Early Jurassic Period. They were among the chief predators of the ancient seas, attacking large sharks, ichthyosaurs and even their relatives, plesiosaurs. The order Plesiosauria are a large and varied group which have been broadly divided into two superfamilies based on their overall body structure. 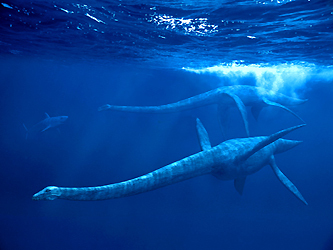 The long-necked, small-headed PLESIOSAURS make up one superfamily named Plesiosauroidea and the short-necked, large-headed PLIOSAURS comprise the other superfamily named Pliosauroidea. An obvious difference between pliosaurs and plesiosaurs is pliosaurs have bodies streamlined for speed and possess a very short neck when compared to the super long necks of the plesiosaurs. Some pliosaurs had as few as only 13 neck vertebra whereas the shortest-necked plesiosaur had 28 vertebrae! The body size of the pliosaurs developed into larger sizes than the plesiosaurs making them a formidable enemy to anything that lived in the ocean during their reign. Both fed on marine invertebrates and had strong jaws with deeply rooted conical teeth. We can learn about what they ate from the fossils. Occasionally stomach contents are found with well-preserved specimens, showing that some at least fed on belemnites and ammonites. Other specimens show bite marks from larger predatory forms. There is a wide range in tooth shape, showing that they were adapted to feeding on different types of prey. Long, slender teeth may have been used to rake through sea-floor sediments in the way a swan dabbles on pond bottoms. Larger, more robust teeth seem to be adapted for feeding on armored fish and cephalopods. Some of the bigger pliosaurs had enormous, dagger-like teeth which were used to attack their smaller relatives. Plesiosaurs were one of the first kinds of extinct animal known to science, and were described as early as 1821. The smallest were about 2m long as adults, the largest were enormous pliosaurs up to 20m long, comparable in size or even bigger than sperm whales (Physeter). They were possibly the biggest predators of all time, though remains of these giants are rare and fragmentary, and much research remains to be done.